You've formulated your product and selected a great container - all that's left is creating the perfect label design. Not sure where to begin? Take a look at our label tutorials for design tips and ideas. Each page provides a step-by-step guide on how we created some of our industry index labels using Adobe Illustrator. It will be easier to see how your final design will look if you work from set dimensions than having to resize your artwork later. 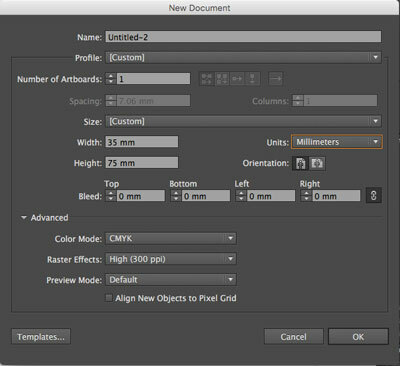 Create a new document in Photoshop or Illustrator. Our tutorials show how to create label designs in Illustrator, but many of the principals apply to Photoshop, too. In the New Document window, enter your label dimensions in the Width and Height boxes. This will be the size of your artboard. Since your label will be printed, set the color mode to CMYK (best for printed media. RGB is used for web graphics) and the Raster Effects to High (300 ppi). Click on the Rectangle tool and place your cursor at the upper left-hand corner of the artboard, dragging to the lower right corner and release to create a basic rectangle . Make sure the rectangle is selected. Use the Selection or Direct Selection tools, or click on the circle next to the path in the Layers palette. Clear any fills or strokes by clicking on the list icon at the top right of the Appearance palette and select Clear Appearance. Now that you have a blank canvas, click on an image below and follow along to create each label design! Click on each label design to view the corresponding how-to tutorial. You will also find a PDF version of these labels and links to the index pages on which they appear.